This month, we are looking forward to Swell Investing’s International Women’s Day event, reflecting on our January Modernist Money Stories gathering, and sharing our latest Investment Insights. 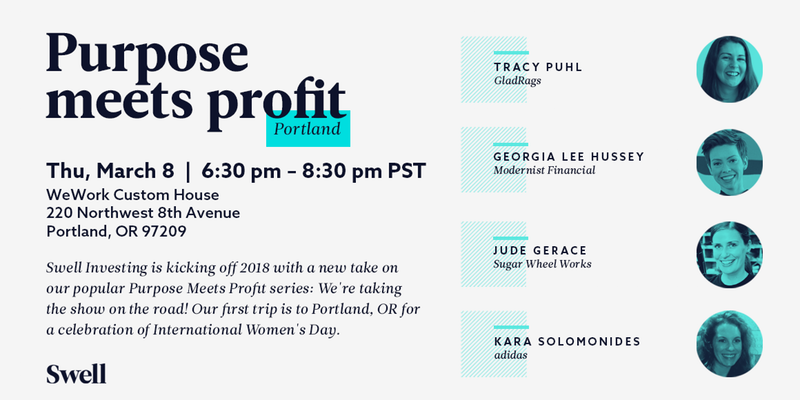 March 8th is International Women’s Day & friends of the firm, Swell Investing, are celebrating with a Purpose Meets Profit party in Portland. They’re bringing together local, socially conscious entrepreneurs to talk about how they do business at the intersection of success and intention. Georgia will be on the panel alongside Tracy Puhl from GladRags, Jude Gerace from Sugar Wheel Works, and Kara Solomonides from adidas. Get your (free) ticket hereto see Georgia speak, while hanging out with some of Portland’s most engaged and progressive business-folk. In January, we kicked off 2018 with a Modernist Money Stories gathering focused on the question: How can we ensure sustainability for artists and the arts? Click here to read more about the discussion and our takeaways. There is a notion in our culture that artists should be able to live on glamour alone. The toxic story that artists don’t need to be compensated for their work was a major theme in our January Money Stories discussion. On 2016’s Futura Free, Frank Ocean echoes a similar sentiment: They paying me momma / I should be paying them / I should be paying y’all honest to God. The market volatility in the last couple weeks has made the previous year fade away in our collective memory. But 2017 was actually quite a remarkable year for investors. In the US, the S&P 500 rose every month of the calendar year for the first time ever. In Q4, emerging markets did even better than the US, and non-US developed markets held their own as well. Check out our latest Investment Insights recordings here. In the Performance video, Georgia discusses how we measure volatility, what the declining dollar meant for your International holdings, and last quarter’s returns. In the Headlines video, she digs into how headlines did at predicting the market, and touches on Bitcoin and FOMO (the Fear of Missing Out). Views and opinions are subject to change at any time based on market and other conditions. The information provided does not constitute investment advice and it should not be relied on as such. It should not be considered a solicitation to buy or an offer to sell a security. It does not take into account any investor’s particular investment objectives, strategies, tax status or investment horizon. You should consult your tax and financial advisor. All material has been obtained from sources believed to be reliable. There is no representation or warranty as to the accuracy of the information and Modernist Financial, LLC shall have no liability for decisions based on such information. Risk associated with equity investing include stock values which may fluctuate in response to the activities of individual companies and general market and economic conditions. Past performance is not a guarantee of future results. Modernist Financial, LLC (“Modernist”) is a registered investment advisor with the State of Oregon. Modernist provides investment advisory and related services for clients nationally. Modernist will maintain all applicable registration and licenses.